MONTH," has been launched from the previous issue. See Nos. 34 and 35 issues to learn The Method Machine. idea (meaning) and one eidos (form) must have been the same. could be called plural music. "Two" (or "three," "four,"
...) is a violating and sexual number. sounds. "Thousands" is a hedonistic and atomic number. previous issue of this bulletin. only Takamatsu's works but also all nature. Read it also. reading. I also updated "Quantum Poem No. 14 - 33,"
appeared in "Method No. 18" and "Method No. 28." 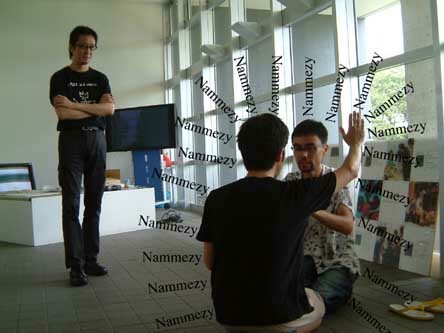 Rehearsal of an imaginary folk entertainment "NA-ME-JI"
composed by students at IAMAS. Photo by Ina Uki. stored in Tansu. In other words, Machine is stored in me. reminds us that a prolonged tragedy will result in a comedy. 2004" now on sale is carrying a detailed interview on me. Museum of Modern Art, Shiga, though I am not a participant. Festival with many other participants from IAMAS!